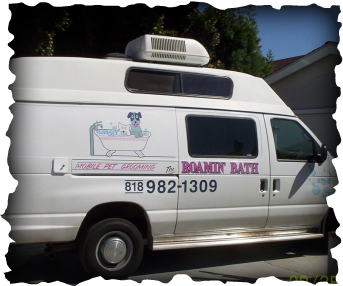 The Roamin' Bath in Sherman Oaks, CA provides mobile pet grooming services to the entire San Fernando Valley. Pet grooming has never been easier. The Roamin’ Bath has a state-of-the-art mobile pet grooming salon with Air-conditioning and Heating, and heated water for your pet's comfort. Whether it is a toenail trim and grind, bath and/or haircut, The Roamin' Bath does it all. All of our mobile pet grooming services are performed in our customized mobile salon at your convenience.